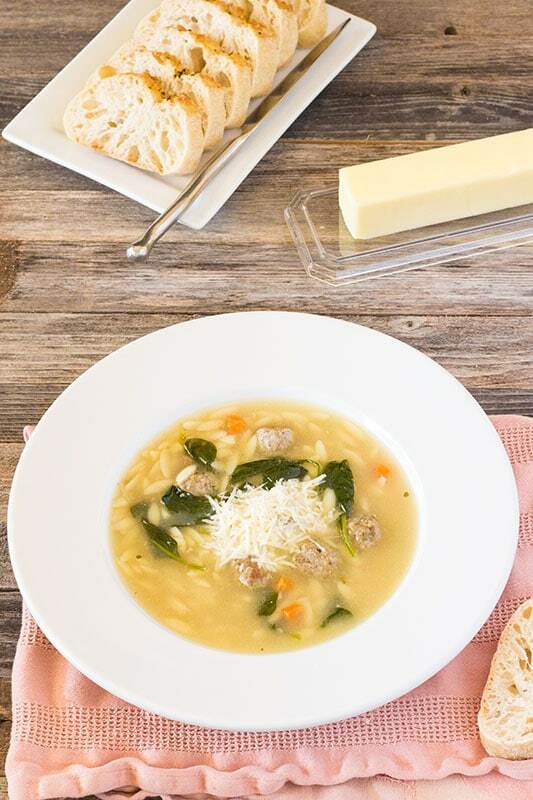 This Italian Wedding Soup Recipe is easy to make and family friendly. Even kids love the tiny meatballs. It starts with a simple chicken broth. It has meatballs which keep spouses and kids happy. I also like that it has spinach in it, and this is about the only way I can get the whole family to eat dark leafy greens. They like salad, but only if it has no spinach or kale in it. I have read somewhere along the line that the carrots in this soup are for luck. There are not really enough of them to affect the flavor, so leave them out if you prefer. I keep them in because it is another way to get vegetable into our diets and I’m always up for extra luck! I bake my tiny meatballs first but feel free to add them directly to the hot broth. You can use just plain chicken broth out of the box or can if you prefer. I usually doctor mine up and cook chicken with it. I use the chicken for other recipes, like Chicken Salad, but it can be removed from the bones, cut into small pieces and added to this soup if you like. 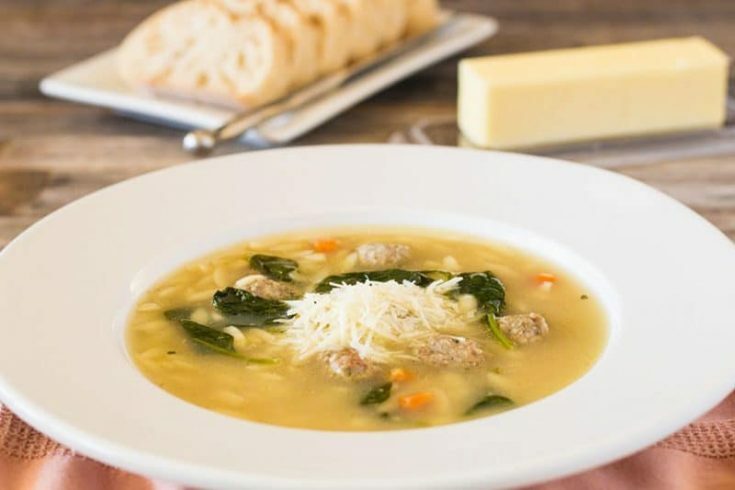 Wedding Soup can be served with grated Parmesan cheese from the big green can, but I prefer to use the shredded Parmesan so readily available in every cheese aisle these days, near the mozzarella. 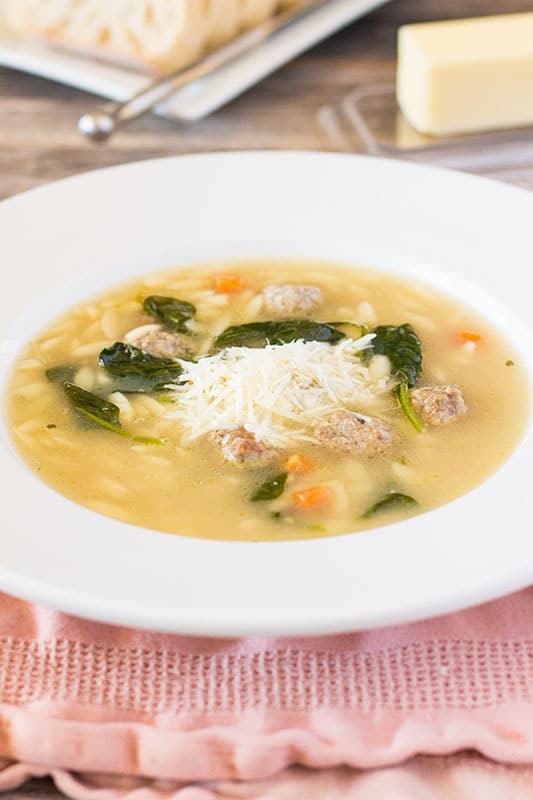 If you happen to have a Parmesan wedge, it is perfect for this soup. No matter which version you choose, know that it will melt and stick to the bottom of the bowl if you use too much. In my bowl, there is no such thing as too much cheese, it just requires a bit of elbow grease when it is time to do the dishes. Chicken broth loaded with mini meatballs and spinach. Put all broth ingredients into a large pan and bring to a boil. Reduce heat to simmering and continue to simmer until chicken is done and vegetables are tender. Strain broth, reserving chicken for another use and discarding vegetables and parsley. Return just the broth to the large pan and bring back to a simmer. If broth is being used without flavor enhancements, bring that to a simmer. While broth is simmering, preheat oven to 375 Degrees F.
Prepare a baking sheet, with sides, by spraying with a non-stick spray. In a large bowl, add ground beef and eggs. Mix well. Sprinkle garlic salt and basil over meat mixture. Mix well. Sprinkle the Parmesan cheese evenly over the meat mixture, followed by the bread crumbs. Mix just until incorporated. Form into small balls using about 1 teaspoon for meat. Baking is optional. Meatballs can also be cooked directly in the broth. Once all balls are formed, place baking sheet into preheated oven. Bake for 15 to 25 minutes, or until meatballs have browned. Add the pasta to the broth and continue boiling until pasta is tender. Turn off the heat and add the spinach. Stir until spinach is wilted. Ladle into bowls and top with shredded Parmesan cheese. 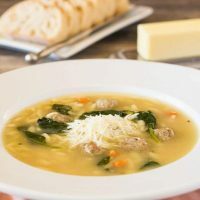 **This can be made with using only the chicken broth, the other ingredients just add a deeper flavor to the base, it will be good either way! Homemade chicken broth can be substituted and will bring extra layers of flavor to this soup.